A year ago I was sat in my uni library stressing about my dissertation so I thought i'd put together a post to celebrate all the people I got to share that with! 1. The one with the books. All the books. They're usually studying something really boring and sit next to you and stack them up so they can't see you. And then spend the next few hours reading about two pages from each while not using the computer they're logged in to. 2. The person who thinks its a cafe. Who sits there eating their packed lunch, chewing and rustling crisp wrappers, dropping crumbs, making it smell like tuna and not doing a single bit of work. All while sat with a sign saying 'no eating or drinking' directly in front of them. 3. The owner of the world's worst ringtone. And possibly the best entertainment you can get in a library. When it's all silent and their phone goes off and their ringtone is Atomic Kitten or Teenage Mutant Ninja Turtles. And everyone looks up and laughs. And yes those are real examples. 4. The lads. Who sit in groups and mainly browse Facebook or spend an hour trying to work out how to write one reference. One of them usually ends up falling off their chair or trying not to make it obvious they're checking out the girl sat next to them. 5. The one who thinks its a cinema. Or at least they give that impression by choosing to watch football/pokemon in the library. Anyone who's looking for a computer will walk past giving them death stares, not that they'd notice. 6. The girls who haven't grown up. Who sit there giggling and taking selfies and browsing the Topshop website or discussing what mascara they're wearing. 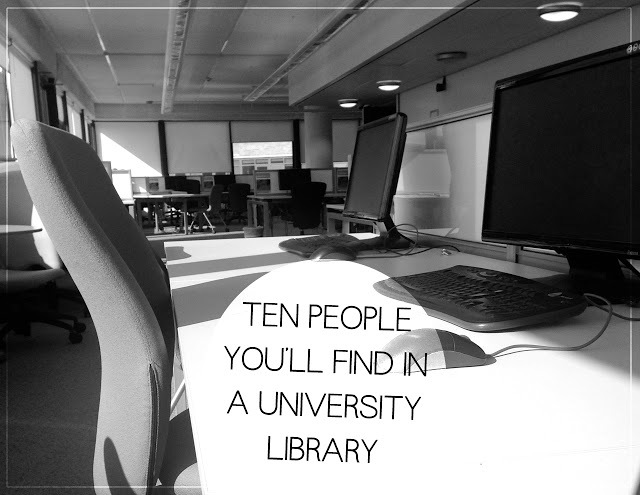 The library is just another social occasion and somewhere to sit. Obvs. 7. The one with the hangover. Who sits there writing very little and drinking a lot of water. Who clearly has a deadline in the next 12 hours and is regretting going out last night while trying not to vomit/fall asleep. The satisfaction of sitting there with no headache and the ability to concentrate is far too good! 8. The person who hasn't had a shower in the last three weeks. Who always chooses to sit next to you. You can't concentrate and you can't be bothered to move and you're just sitting there hoping they'll only sit there for five minutes. Which turns into two hours and there are no windows and the smell is making you want to be sick. Is this a good enough reason to get a deadline extension? Yes it is. 9. The couple. Who walk in holding hands and make it quite obvious they can't be separated. They have to share a computer and spend far too much time staring into each others eyes/whispering/laughing. Not something you really need to see when you've got 5,000 words to write. 10. The one with the bad taste in music. Who sits there with heavy metal/rap music blasting out of their earphones and would have a ridiculous excuse if anyone complained. At least listen to something with words if you want to distract me! Sorry I'm leaving a comment under Christina, the comment box doesn't come up on my computer for some reason! I was like that person with the million books, but crying silently with regret that I didn't start my essay like 8 weeks ago when it was released, rather than 2 hours before. So glad I don't have to write essays anymore!! Love this post, I used to be the one that would be making this list like yourself! Always used to irk me why people came to the otherwise quiet computer room to make a whole heap of noise and not actually use the computers! Yeap I can relate (when I was at Uni anyway) from the 'person who hasn't had a shower for weeks' I met that person few times and I had to move sit as further away as possible.